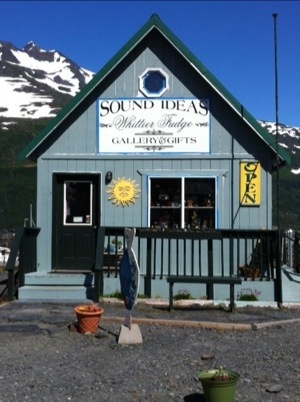 My second post for the day is about our trek from Valdez to Whittier to Alyeska Ski Resort. Hope you enjoyed the first post, “An Affair to Remember”. I got a lot of positive feedback on it from those of us riding the Roubais this week. …Up at 4:30 am today and it was already beginning to show light in the horizon. Breakfast at 5am. Walk to the Valdez to Whittier Ferry. On board at 6. Shove off at 6:15. It’s foggy and can’t see a thing for the first hour, but eventually the spectacular views open to us. 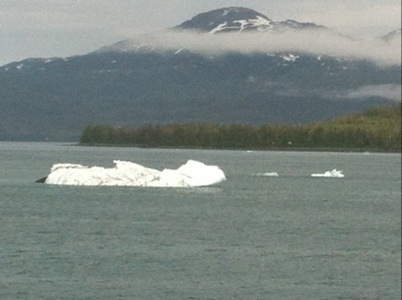 We are surrounded by snow capped mountains in Prince William Sound, scattered with icebergs! Nothing too big, but lots of them. Incredible sight! And when we take our eyes to the mountains, we see several glaciers, the source of the icebergs. It’s truly hard to describe the scene, so I’ve attached some photos. 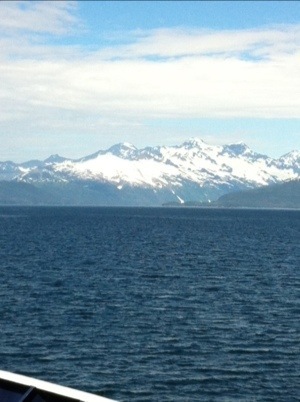 We then saw a Humpback Whale making lazy progress up the Sound. A sight I’m told is frequent. We saw Sea Lions sleeping on a buoy, another common occurrence. I chatted up some of the people I had not yet had a chance to really know. I worked on my blog. Then took a well earned nap in a very comfortable reclining captain chair provided for passengers. This is a very upscale ferry and I’m sure some of my tax money is supporting it. I’m OK with that. 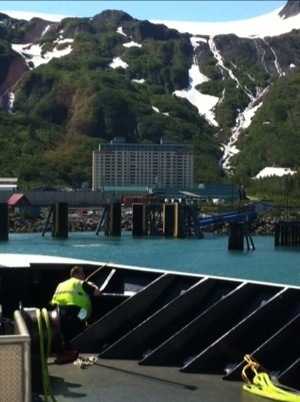 We had lunch on board and docked in Whittier at around noon. Whittier is a town of 230 people and most live in the building in the photo attached. No kidding. This is a remote place originally built as a military outpost in WWII to protect the Aleutians from attack. It’s not more than a dock for tourists coming across the Sound now. But, we passed through a one lane tunnel about 2-1/2 miles long that using current technology would be a challenge to rebuild, never mind what they had back in those days. We drive into Alyeska Ski Resort, the only one in all of Alaska. 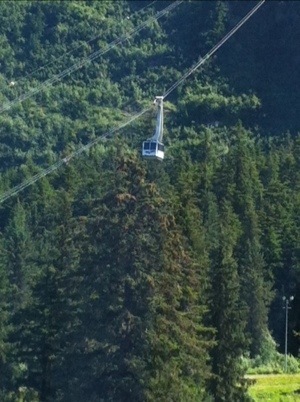 Tim and I took the tram to the top and saw a Bald Eagle fly right over the tram. On the way down, we saw a huge Moose grazing in the grass. Didn’t get pictures of any of them, but I have witnesses for each sighting. 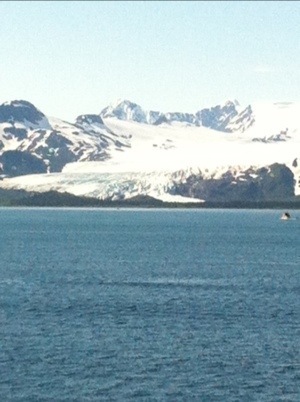 Yesterday, Mary and I saw a bear on the bike ride, so I completed the sighting of the big 3 of Alaska today!! Whoopie!! The resort is luxurious. Went to the hot tub to loosen up the muscles for tomorrows ride. The highlight of today was getting a chance to better know our 3 guides while not riding today. Mason, Gabe and Dave have been fantastic guides, coaches, playmates, cooks, doctors, wrenches and cheerleaders. The amazing thing is they team up so well to always know when to be where you need them, at the time you need them, with the right skills working in your favor. In their own right they are intersting people, with a wealth of knowledge about Alaska, and the enthusiasm and bottomless energy to deliver a great experience for each and every one of us. It’s been truly a pleasure to know them and be alongside them for this experience. They say it’s the people that make a difference, and these three guys made a huge difference for all of us on this trip. I will do another Backroads Tour, on the strength of the experience these guys provided alone. Anyway, time for dinner. Check tomorrow for another chapter.